On this luxury 9 day tour from Vancouver to Winnipeg, witness the Grizzly & Polar bears in the natural habitat, plus experience a thrilling dog sled adventure. These nine days offer an exclusive opportunity for Scenic guests to seek out two of the most exciting and powerful creatures on Earth. Journey first to Campbell River and then on to Knight Inlet, one of the best places to discover bears in their natural habitat. With amenities and guides available to get you as close to the action as possible it will be an unforgettable experience. 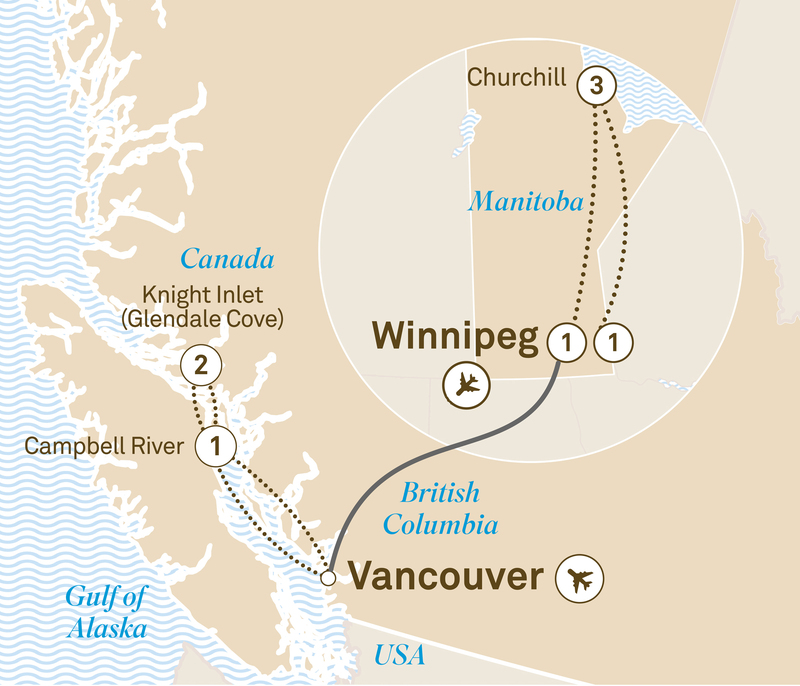 From there you’ll head into the vast interior of Manitoba and arrive in Churchill. Churchill is one of the few human settlements where polar bears can be observed in the wild. You’ll have three nights to observe these magnificent creatures, as well as exploring the tundra and experiencing an authentic dog sledding adventure. It may only be nine days, but the memories will last a lifetime. The ultimate bear adventure awaits as you board your flight from Vancouver to Campbell River, situated on the east coast of Vancouver Island. After checking into the Comfort Inn & Suites for the night, explore the town. Board a floatplane and marvel at the magnificent views on your way to Glendale Cove, Knight Inlet, home to one of the largest concentrations of grizzly bears in British Columbia. Your cosy floating lodge for the next two nights, Knight Inlet Lodge, is exclusive to Scenic. Venture up the estuary through shallow tidal waters in search of these impressive and awe-inducing creatures. Later, enjoy lunch at the lodge before a second bear viewing tour and a sightseeing cruise, taking in the natural wonders of Knight Inlet. Evenings at the lodge are the perfect end to an amazing day, where you can relax and catch up with your fellow adventurers to share the day’s highlights over a sumptuous dinner with included wine. Today, you may choose to venture out on a guided walk, or take a guided tracking tour. There are more bear viewing opportunities before dinner so you’re sure to get plenty of amazing photos. Board your charter flight to Churchill, the polar bear capital of the world and the perfect place to witness these amazing creatures in their natural environment. Enjoy a tour of the town, situated on the banks of Hudson Bay. Tonight, enjoy a slide presentation by an acclaimed local photographer. For the next three nights you’ll be based in a Churchill hotel. View majestic polar bears and other arctic marine life from your purpose-built Tundra Buggy, which will allow you to move freely to view and photograph these magnificent creatures. Your naturalist guide will provide insights into the environment you’re entering and the array of wildlife you’re likely to see. Experience a thrilling dog sled adventure with a local dog sledding expert. Learn about dog sledding history before enjoying an exhilarating ride behind a strong team of Siberian Huskies on a custom made sled (or cart, weather permitting). Join the mushers for hot chocolate and bannock, a tasty First Nations delicacy, and share their intriguing personal stories. This afternoon, visit the Parks Canada Interpretive Centre to learn more about the tundra and its spectacular wildlife. Explore the tundra of the Churchill Wildlife Management Area further. Later, board your return flight to Winnipeg and stay overnight at Four Points Sheraton Airport Hotel. Sadly, your bear adventure must come to an end as you transfer to Winnipeg airport. This is an independent tour, not escorted by a Scenic Tour Director.